Earlier this year we introduced some objectives explaining what we aim to achieve by the time we move from beta to live in April 2016. Here is an update. ‘Readiness’ means that by April 2016, all central government services (and those devolved in Wales and Northern Ireland) that need to adopt GOV.UK Verify, are able to do so. We expect about 25 services to be ready to start using GOV.UK Verify by the time we go from beta to live, and we’re on track to be ready to meet that demand. There are now 13 government services from 5 departments connected to GOV.UK Verify, with 8 available as public beta services. 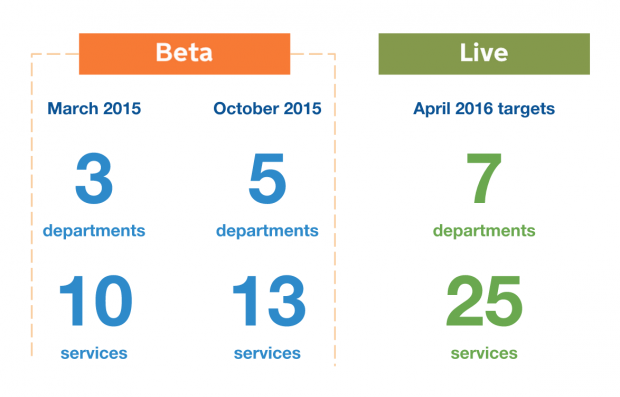 We’re working with 50 government services and 10 departments altogether. We’ve developed a staged process for services that want to use GOV.UK Verify, and we’re constantly developing that so that it’s as clear as possible to services what they will need to do, and any new needs arising from new services adopting GOV.UK Verify are understood early on so we can meet them in time. 90% demographic coverage by live means 90% of the overall UK adult population should be able to use GOV.UK Verify, and 90% of people expected to use GOV.UK Verify to access each service in our pipeline should be able to do so. 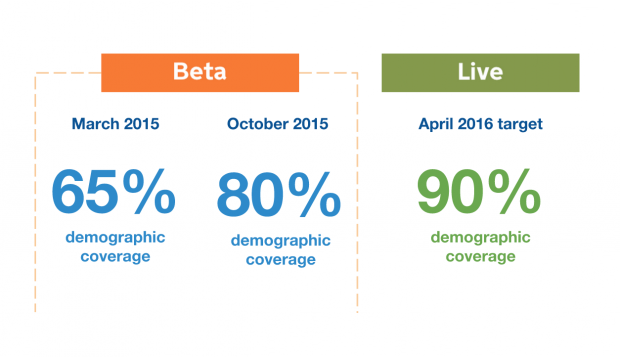 GOV.UK Verify’s demographic coverage is 80% now (up from 65% in March) and we’re on track to hit our 90% target by April 2016. Good demographic coverage demands a wide range of ways for people to verify their identity using GOV.UK Verify. The certified companies are building new methods all the time to improve this range. For example, it’s now possible to verify your identity using any passport, any EU identity document, any bank account or payment card, and you will often only need 2 pieces of evidence, rather than 3. We posted yesterday in more detail about the progress we’ve made against this objective. The success rate measures success vs failure among those who set up an account and try to verify their identity with a GOV.UK Verify certified company. Like demographic coverage, the success rate of GOV.UK Verify depends on a wide range of certified companies offering a wide range of methods to verify identity. 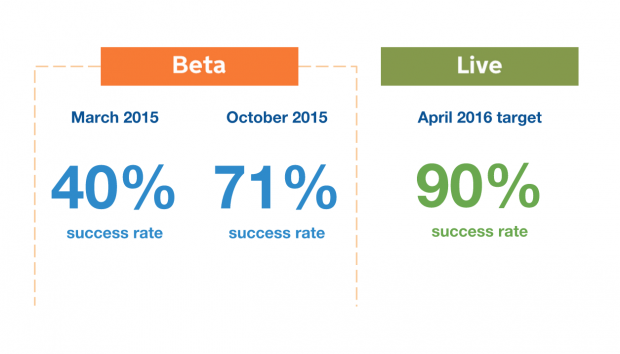 We’re on track to hit our target for live of 90% success. This is different to demographic coverage. This target involves offering people who can’t verify their identity another way to access digital government services. We recently posted about our trial of basic identity accounts, which are one possible way of achieving this target. We’re working with departments to assess whether there’s a future role for basic accounts, and if so what that might look like - we’ll post here when we’ve got more news to say about that. There are now 4 certified companies available for users to choose from: Digidentity, Experian, Post Office and Verizon. 5 more due to join by January 2016: Barclays, GB Group, Morpho, Paypal and Royal Mail. We’re continuing to make progress in taking the companies through all 16 gates they need to pass before they can join GOV.UK Verify under the new contractual framework. This process applies to both new and existing certified companies as their services have to be assessed against the requirements of the new framework. We’re almost half way through these gates now, and we’re currently expecting the certified companies to be on board well ahead of our target date of April for moving from beta to live. We are continuing to develop and improve GOV.UK Verify so that it’s ready to move from beta to live. This includes work to scale the service, continuously iterate and improve it, meet all our accreditation requirements at each stage of our development, and prepare so GOV.UK Verify is ready for operations at a larger scale across a wider range of services. We’ll post more updates as we go along and look forward to your questions and comments.